The most fresh, daring and original fairy tale adaptation in recent memory. The French fairy tale La Belle et la Bête has been adapted an insane number of times. It’s been made into a feature film at least ten times and has been a television show twice (three times if you count ABC’s Once Upon a Time). So it’s a bit of a shock that director Christophe Gans (Brotherhood of the Wolf, Silent Hill) has managed to make his new version of this well-known story into the most fresh, daring and original fairy tale adaptation in recent memory. Gans co-wrote this new version of Beauty and the Beast (well, sort of new: it was released in France in 2014) with Sandra Vo-Anh. They based their screenplay on Jeanne-Marie Leprince de Beaumont’s 1756 telling of the fairy tale. The script is the most traditional part of Gans’ adaptation and it follows de Beaumont’s story, which differs from the 1991 Disney version that American audiences know and love. In this telling, Belle, played here by Léa Seydoux of Spectre and Blue is the Warmest Color, is one of six children of a wealthy merchant (André Dussollier of A Very Long Engagement). When the merchant’s ships get lost at sea, the family becomes destitute and is forced to move to a country cottage. The merchant then goes on a journey, hoping to find the remains of one or more of his ships. As he’s leaving, he asks his daughters what gifts he should bring back for them. While Belle’s vain older sisters ask for dresses and jewelry, Belle asks for a single rose, as she cannot get one to grow in the country. The merchant loses his way in the forest and finds an abandoned castle, which just happens to be surrounded by a sea of red roses. The merchant picks one and the horrible Beast (Vincent Cassel of Black Swan) appears, telling the merchant that he has forfeited his life for the rose. He is permitted to go home to tell his children of his fate before returning to the castle, but when he tells Belle she locks him in a closet and journeys to the castle in his place, where she offers herself to the Beast. Though the story is well told, it takes a back seat to the visual splendor on display in Beauty and the Beast. The framing device for the entire film is a storybook come to life, and it works beautifully, with the book’s charming illustrations slowly changing into real shots. Christophe Beaucarne’s stunning cinematography manages to hold onto the storybook feel, and each new scene feels like a discovery. These scenes are aided in no small part by Pierre-Yves Gayraud’s costumes, particularly Belle’s dresses, which are done in eye-popping jewel tones. Though Gans overindulges in special effects, even the scenes that are poor in terms of technology are wonderfully artistic. The Beast’s castle is a stunning, constantly changing marriage of nature and architecture, and it is a joy to explore its candlelit halls alongside Belle. These castle explorations are especially captivating because of Pierre Ardenot’s score, which is gentle and mysterious at times, whimsical at others, grand when necessary and always lovely. 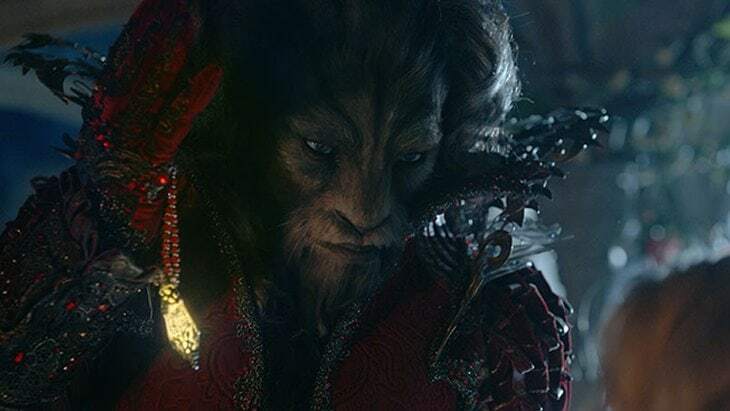 Beauty in the Beast has much in common with films from the 1980s mini-boom of fantasy, films like Labrynth, Willow, The Princess Bride, Legend and Return to Oz. While those films also fell into a kind of general fantasy aesthetic, that familiar approach allowed them to add a variety of original quirks. Beauty and the Beast’s baroque beauty may invite criticism because of how traditional it seems at first glance, but by placing the story in an expected setting, Gans gives himself the freedom to pack flourishes and minute detail to every single scene. These flourishes and details are present in abundance. The film is paced slowly, but patience is rewarded. Long introductory scenes allow us to understand Belle’s devotion to her father and a series of flashbacks spread throughout the film give the Beast a much meatier backstory than he has in the Disney version, which gives Cassel a chance to act outside of his Beast costume. The results are emotionally rewarding and even surprising. And though Cassel turns in a fairly tremendous performance in those flashback scenes, the film belongs to Seydoux, who was born to play a fairy tale princess. Gans wisely tells much of the story through close-ups on Seydoux’s expressive face. She can go from joyful to sad to curious without moving anything but her eyes. She gives her Belle a mischievous side, accomplishing this with the faintest quirk of an eyebrow or curl of the lip. Beauty and the Beast does fall short in a couple of areas. The most notable is the design of the Beast. The Beast looks good when standing still, but his movements are too obviously computer generated. This, coupled with a strangely unexpressive face, makes it hard for Belle and the Beast to establish much in the way of believable chemistry. The film also gives Belle and the Beast surprisingly little time together. There’s a weak, one-dimensional villain, the Gaston-esque Perducas (Spanish actor Eduardo Noriega of Open Your Eyes) and some very strange CGI beagle-rabbit creatures that take the place of the Disney film’s talking furniture. These little creatures feel as if they were shoved into the film to make it more appealing to kids. And all of the characters are white, which is a particularly glaring oversight given the fantasy setting. These flaws aside, Beauty and the Beast is a film that is sweepingly beautiful with a story that is familiar but mysterious. The roles are perfectly cast and the performances are splendid. In a time when so many of the films being made feel recycled and unoriginal, it’s a thrill to watch Beauty and the Beast: a tale as old as time, for sure, but done in a way that has never been done before.